The form and function of our body should work in harmony with the form and function of our clothing. The form of bodies comes in all different shapes and sizes. The form of an article of clothing should compliment the form of the body. This principle is why I eventually stopped wearing baggy saggy jeans. It became annoying to be routinely adjusting my jeans, and keep from tearing up the hem of my pant legs under my shoes. It is also the same reason why I haven’t jumped aboard the current trend of wearing slim or skinny jeans. I’m not a big fella by any means but I’ve got a strong and built set of upper leg muscles. Not to mention that… well… let’s just say that skinny and slim jeans do not favor those of us that have a little junk in the trunk. Skinny jeans were made for skinny people and there are way too many people I’ve seen, who are by no means skinny wearing low-rise skinny jeans. That would be the form and function of bodies and clothes in chaos with one another. I bring up low-rise skinny jeans because we should be advising our young boys about it with the same zeal as we do young ladies in regards to their bust line. Some cleavage is okay, and some cleavage is always wrong! (Sorry, I couldn’t resist the humor in that play on words). This one is not that difficult on the surface. Clothing should also work in harmony with the occasion that we are dressing for. 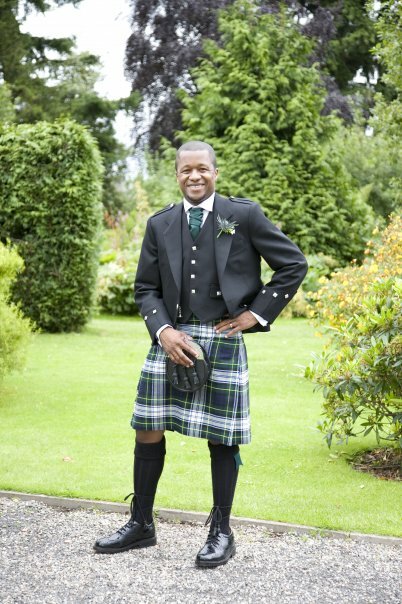 I wore a kilt for the majority of my wedding day which people are always enamored by. The reality is that I married a Scottish woman, in Scotland, and that of the 30 plus men and boys in attendance you would have been oddly out off place if you weren’t in a kilt. In full regalia a kilt is very formal and appropriate for fancy events and special occasions. When I take my eighth graders on their eighth grade trip to the amusement park Cedar Point, I always advise them to wear shorts with pockets. I don’t particularly understand young teen boys obsession with wearing basketball and soccer shorts everywhere, but stuffing their money in their sock (and then accusing someone of stealing it when their money goes missing) or expecting me to carry their wallet around when they’re four years away from adult independence is just not going to fly on my watch. Last night one of the examples I gave of culture in the Bible, more specifically of culture gone bad is, “The Tower of Babel” story. One of the reasons why it was culture gone bad is because the people who were building it were doing so to define themselves, “let us make a name for ourselves” (Genesis 11.4). As image bearers of the living God and blessed to have dominion and authority over the earth, we should never allow for a piece of the earth, whether it be a tower or a piece of clothing, to have dominion and authority over us. We define the clothing not the other way around. Next Next post: Can Overtly Sexual Commercials Be A Golden Opportunity With Your Teen?